Speckled Mountain walk, Ben Vrackie, Pitlochry, Tummel valley, Loch a'Choire. 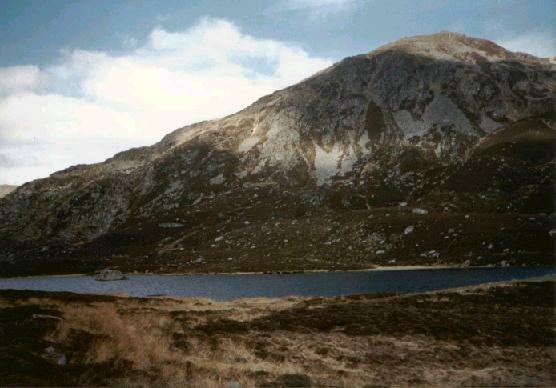 Rising to 2758 feet (841m) high, Ben Vrackie is often overlooked by hillwalkers heading for higher peaks. 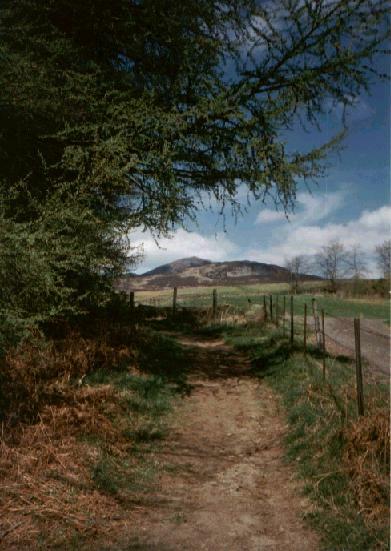 But the route to the top offers a taste of all that is best in the great outdoors - peaceful woodland, wide open moor, a tranquil upland lochan and a summit offering some of the finest views in the country. A path leads all the way to the top if you start your ascent from the small car park nestling in woodland on the hillside to the north of the tiny hamlet of Moulin, above Pitlochry. Once ready for the off, leave on a path heading north through the trees, a small burn gurgling away to the right. The way rises steadily to meet a track and, on the other side, continues straight ahead, this time with the stream cutting a channel through the rocks to the left. Rising more steeply now, the way climbs to a fence bordering an open field and track and follows it for a short distance, Ben Vrackie in view up ahead. The track is joined a short distance on and followed for a hundred yards or so until the path is picked up again on the right. It crosses the burn by a wooden footbridge and leads north through mixed woodland before following a shady ride through a plantation of larch to reach a ladder stile at the top of the woods. With the confines of the conifers now behind, an obvious path rises over open moorland, passing beneath a line of overhead cables. As height is gained, views open out over Pitlochry and the Tummel valley to the south and, ahead, Ben Vrackie dominates the upland horizon. Sheep graze the hillside here but you may also be lucky enough to spot grouse, roe deer and mountain hare. The path climbs steadily - with a seat for a well earned rest part way up - to a ladder stile. Beyond this it flattens out, then drops to Loch a'Choire. The lochan, hemmed in at one end by a low man made embankment, is a peaceful spot, the clear water rippling gently in the shadow of Ben Vrackie. Following the route to the east end of the lochan avoids a boggy stretch of ground and, once over the embankment, a path climbs over a low ridge of ground before the final stretch of ascent begins. A narrow path rises through the heather to join a wider trail a little way up. This climbs steadily, and steeply, into a shallow coire to the east of the top which sits proud above a sharp barrage of jutting crags. Ben Vrackie translates from the Gaelic as 'speckled mountain' and when you see the rock-strewn slope glittering is the sun, the source of inspiration is obvious. Curve left and a final pull through rocks brings you out on the top, home to a trig point and a cairn complete with panoramic viewfinder highlighting features in the scenic landscape rolling out on all sides. The scree-covered peaks of Carn Liath and Beinn a'Ghlo to the north are the most obvious upland landmarks while, to the south, Strath Tay stretches into the distance. When you have sampled the delights of the summit long enough, retrace your steps down the hill, over the moor and through the trees back to the start. Map OS Landranger 1:50,000 sheets 43 and 52. Start/parking Small car park, signed on the road from Moulin. Turn left immediately behind the hotel in the centre of the village (grid ref NN 944596). The car park is small and can be busy, particularly at weekends. Grading A fairly strenuous ascent best tackled by fit walkers and older children. The final stretch from Loch a'Choire is steep and the summit exposed.